Vals Stone is a favourite material at TG Studio. 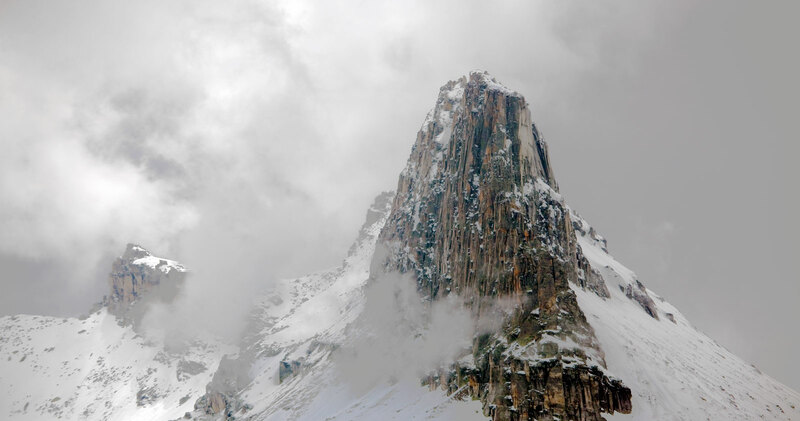 As it is directly hewn from the Swiss mountains, it is perfect in creating an alpine mood. It has a distinct fine-veined texture that is solid, compact and frost-resistant. The stone was created during the formation of the alps, which resulted in the unique colour mixing of quartz and felspar crystals. 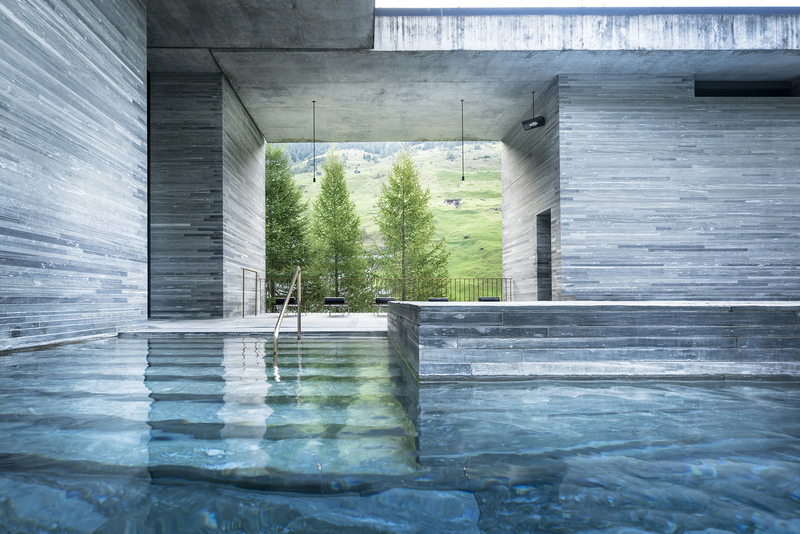 Peter Zumthor has famously used it externally at The Therme Vals (pictured above) where the stone is cut in long thin tiles and is self supportingly used as cladding. For internal applications, we like using it as tiles on bathroom floors. The natural product stone is historically the choice for a hard floor surface. Our ancestors used marble in palaces in Italy and slate in farmhouses in England. Later, artisans produced clay tiles in many colours and gazed these tiles to make them hard wearing. Industrialisation has made this product economically available to all. However, for many homeowners it can be difficult to choose between the two. Here’s a guide to their advantages and disadvantages. … It depends on the situation! 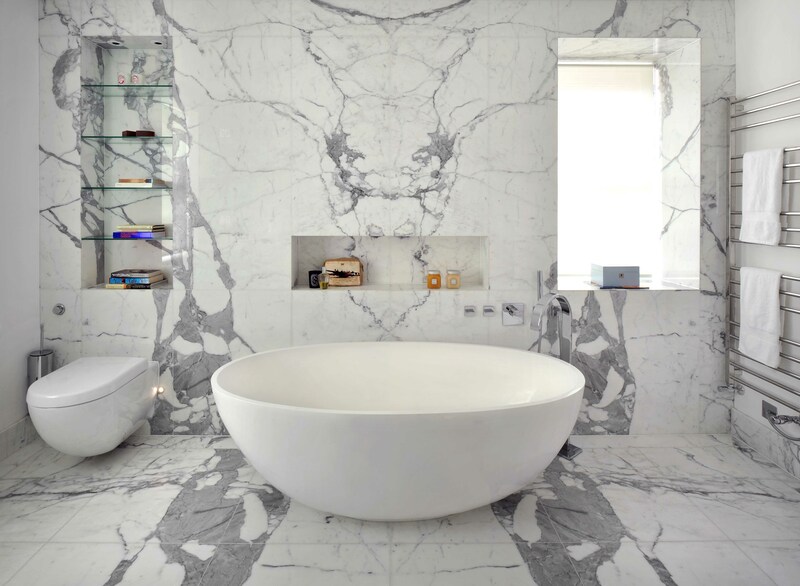 If a client wants a veined marble look and has the funds, real stone would our choice as the look and feel are unrivalled by any other material. However, if a client likes randomly textured stones like the Vals Stone but the budget or maintenance are key, our choice would be a ceramic tile such as Mystone Pietra di Vals by Marazzi. We would love to know your thoughts and whether you prefer ceramic tiles or natural stone? !